It is now the month of love, and there are few birds I love more than the alcids. Thus, a day of murrelets and their names. According to Reedman, murre is the old Cornish world for a Razorbill, and eventually* became a vernacular term for alcids more broadly; murrelet, then, makes simple sense as a name for the smaller members of the family. Some murrelets are named for their styling. This may be surprising in a group of birds that – let’s be honest here – all tend towards the drab, but the Marbled Murrelet was not named for its luxurious bathroom finishes. The Long-billed Murrelet, well. 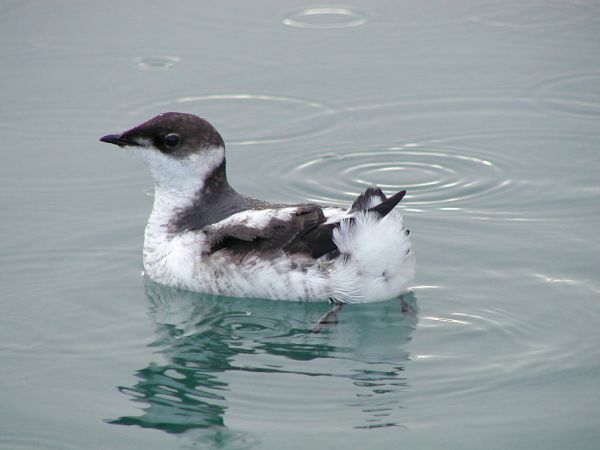 Even more surprising, the Ancient Murrelet is also descriptively-named. Update, h/t Rick Wright:Thomas Pennant attributes the name to the loose white feathers at the bird’s nape. It’s poetic, and anything beats naming your murrelet after the money men, as in the case of the unfortunate Craveri’s Murrelet, which honors two brothers who were major donors to the Turin Museum of Natural History. The Kittlitz’s Murrelet at least is named after an actual naturalist, Heinrich von Kittlitz, who bummed around the Pacific on behalf of the Imperial Academy of Sciences at Saint Petersburg. Besides his murrelet, Kittlitz collected the only known specimens of the Kosrae Starling, a lovely long-beaked black bird that deserved better. Likewise the Xantus’s Murrelet, named for John Xantus de Vesey, a Hungarian exile who discovered a number of birds in western North America. Except now there is no more Xantus’s Murrelet. There is the Scripps’s Murrelet, named for the money men again – this time for the newspaper magnate who provided the yacht used to discover what was then deemed merely the northern subspecies of the Xantus’s. The same Scripps newspaper fortune went into founding the Scripps Institute of Oceanography, which is at least of some use to murrelets in general. The southern species of what was the Xantus’s Murrelet is now called the Guadalupe Murrelet, a soothing name derived from the island where the bulk of the population breeds. The Japanese Murrelet, well. So there you have it. A small handful of small birds, named in the ways birds are so often named – for what they look like, where they’re found, or who the finder wanted to impress. Utterly commonplace. And yet the birds themselves remain mysterious and lovely. Featured image: Juvenile Marbled Murrelet by Rich MacIntosh courtesy of the U.S. Fish and Wildlife Service. *The inestimable Rick Wright informs me that this coinage is specifically the work of American ornithologist Elliot Coues. It appears he proposed it in his 1868 paper “A Monograph of the Alcidae”. I love them, too. We go down to the Redwood coast, CA, quite frequently; always hoping to see a live Marbled Murrelet….we’ve heard them!